Dental emergencies require medical attention as soon as possible but you may feel stressed about finding an emergency dentist. However, these dental conditions are serious so it’s important that you find help as soon as possible. Luckily, there are many after-hours dentists and dentists who are open over the weekend which can make it easier for you. If you’re in Salem, Oregon and suffering from a dental emergency, this website has a lot of helpful information to get you the help you need. They helped me find a dentist fast when I lost one of my tooth fillings. We can help you find the treatment you need for your dental emergency. Here is a list that we’ve compiled of emergency dentists available for you in Salem, Oregon. Description: Call to speak to an operator 24 hours a day, 7 days a week and schedule your emergency dental appointment in Oregon fast. Description: This excellent emergency dental practice is led by Dr. Giruc. She is an expert in periodontics. Description: Oregon Smile Care Center is open late on Wednesdays and Thursdays for any emergency dental needs. Description: Glen Creek Dental has early morning hours to make it convenient for you to receive care before work. A visit to an emergency dentist in Salem will be similar to any visit to a general dentist. Be sure to speak with office staff when you schedule your appointment to make sure that your payment method and dental insurance is accepted. If you don’t have dental insurance and need to set up a payment plan, the dental clinic staff will be able to help you do so. Before you head to your appointment, gather any recent medical and dental records. These will help your dentist decide how to treat your dental emergency. It’s also important to arrive at the dental clinic about 15 minutes early to fill out any paperwork. Finally, if you have any anxiety or fear of the dentist be sure to let the staff know so they can accommodate you during your visit and make sure you are comfortable. Most dentists are qualified to treat dental emergencies. 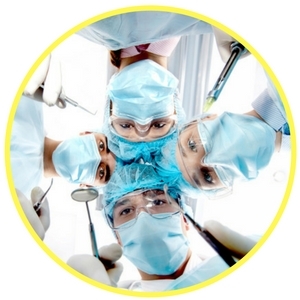 They are more common than you may think so dental clinics are always prepared to handle them. Common dental issues include lost crowns or fillings, chipped teeth, or a lost tooth. These can all happen for many different reasons. Below we discuss some of these common dental issues and some at home treatments for you to try and alleviate your pain while waiting for your dental appointment. It’s common for someone to lose one of their crowns or fillings. If you’ve lost one of yours, clean it gently with water and keep it in a safe place. Use dental cement or gauze to cover the open tooth until your dental appointment. Left unprotected, the tooth could continue to decay and quickly become more serious. 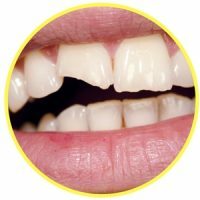 Chipped and broken teeth happen often and dentists can easily fix them. If you’ve chipped one of your teeth, carefully rinse out your mouth to remove any remaining pieces in your mouth. Then, try an find the broken pieces and place it in a small container of milk to bring to your dental appointment. Use a cold compress on the outside of your mouth and cheeks to reduce and swelling and pain. For various reasons, you may lose one of your teeth. If this happens, try and locate the tooth that has fallen out. Be sure to never grab the tooth by the root as it can cause irreversible damage and the dentist will not be able to replace it. Gently grab the tooth by its enamel and place it in a cup of water or milk to preserve it until your appointment. 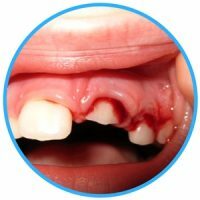 If there is a lot of blood you can place gauze over the open spot in your mouth. There may some instances where your dental emergency requires an emergency tooth extraction. 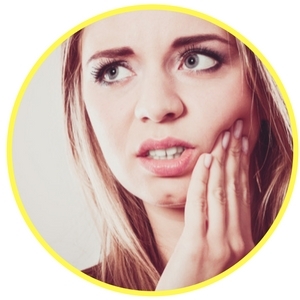 This could be because of an impacted tooth or a severely decaying or infected tooth. Getting a tooth extracted before it becomes more serious can decrease your need for medication and help you prevent any further complications. Generally, it takes about two weeks to heal from an extraction. Pain will be controlled by painkillers if necessary and you are encouraged to rinse your mouth with warm salt water to promote healing. It’s important to know whether you should see an emergency room doctor or an emergency dentist. If you’ve suffered any injuries to the head or any kind of head trauma, it’s best that you visit the ER. The doctors there will be able to treat your best for your injuries. However, if your injuries are mouth related you will be able to be treated better by an emergency dentist. Dentists in Salem, OR offer a verity of emergency service options and are equipped to treat you for whatever condition you may be dealing with. Visit the American Dental Association at http://www.ada.org/en to confirm that the dentist you’ve chosen is licensed and certified in your area. This is also a good resource for all things dental care. You can also visit the Oregon State Dental Association at https://www.oregondental.org/ for information on dental care in Oregon and search for local dentists. Finally, don’t forget our service, Emergency Dentists USA, is available 24 hours a day, 7 days a week and can help you find the dental care you need.